LEGO® SERIOUS PLAY® fosters creative thinking. 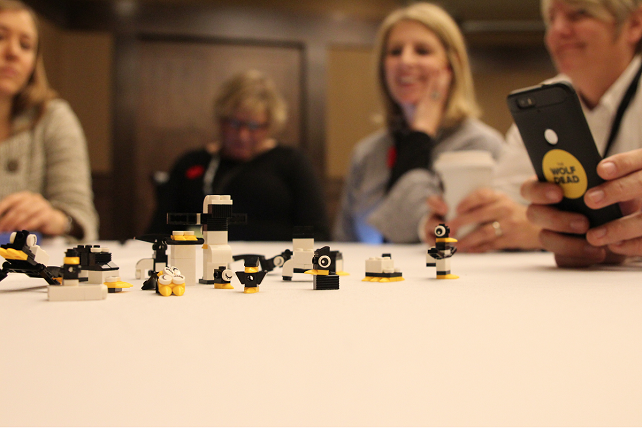 Teams build metaphors while they play with LEGO® bricks. Watch the video introduction to LEGO® SERIOUS PLAY® below. Anyone can just grab some LEGO® bricks and play with them! However, to ensure results of the LEGO® SERIOUS PLAY® session and to make sure that it provides tangible outputs – the only ones who provide you with consistent and warrantied SERIOUS PLAY sessions are experienced individuals – trained SERIOUS PLAY facilitators. 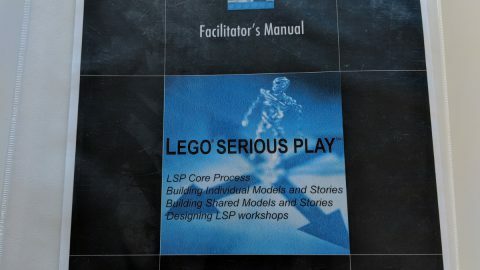 LEGO® SERIOUS PLAY® is a radical, innovative, experiential process designed to enhance business performance. It is based on the belief that everyone can contribute to the discussion, the decisions and the outcome. The use of LEGO bricks simply enables you to take a speedy shortcut to the core. The bricks work as a catalyst – and when used for building metaphors, they trigger processes that you were previously unaware of. With LEGO® SERIOUS PLAY® you will inevitably surface things that are difficult to discuss and save time through deep dialogue about your complex issues so you can make more, better and faster decisions. 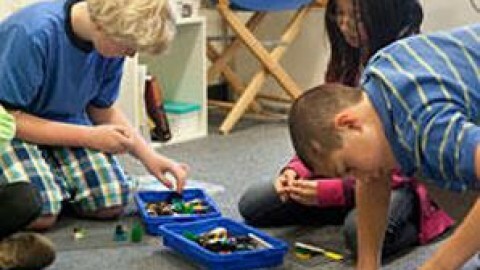 LEGO® SERIOUS PLAY® levels the playing field, engaging 100% attention and participation. Fully harvest the insight, ideas and imagination available in your organization. LEGO® SERIOUS PLAY™ taps into the human ability to imagine – to describe and make sense of the business at hand, to initiate change and improvement, and even to create something radicially new. Building landscape models with LEGO bricks, giving them meaning through storymaking, and playing-out various possible scenarios, deepens understanding, sharpens insight, and socially “bonds” together the group who “plays” together. Participants come away with increased confidence and more committed to the shared and common goals. The underlying values of LEGO® SERIOUS PLAY® include the belief in the potential of people, and also the belief that everyone within an organization can contribute to the discussion, solutions, and outcomes. 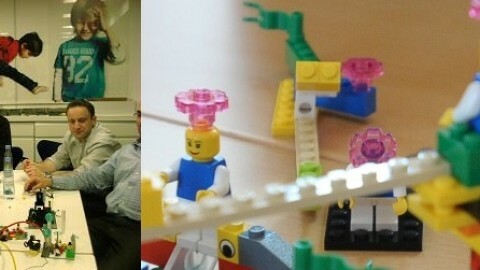 When you as a leader or manager want to gather the total individual and team brain power to work on complex business issues such as developing strategy plans, resolving conflicts, forming and developing teams and working with turnaround and restructuring –then LEGO® SERIOUS PLAY™ is the method of choice. Unfortunately, in too many situations the reality is that people don’t leave such meetings with a sense of what was just described. Too much energy, too many ideas, too many opportunities are lost with the result that people feel less motivated, not involved, not taken seriously. 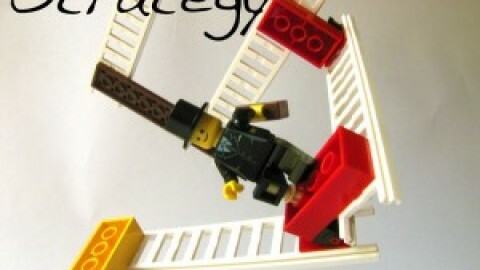 LEGO® SERIOUS PLAY® methodology deals with exactly that challenge. It is a language, communication tool, problem solving methodology, based on the belief that everyone can contribute to the discussion, the decisions, and the outcome. LEGO® SERIOUS PLAY® builds on a REAL TIME process, which begins with the “right now”. It draws in relevant parts of the past and integrates this with the future hopes, aspirations and fears of everyone in the room. It is brought to the process to find out what can and should be done today. Being better at “now” results in being better prepared for challenges and opportunities in the future. Traditional business tools typically analyze the past and speculate about the future. The LEGO® SERIOUS PLAY® products incorporate elements from the past and future and test them through scenarios in Real Time to achieve improved decision making immediately. Strategy development and exploration – Examine and evaluate relations to external partners and clients. Organizational development – For management, teams and individual employees. Innovation and product development – Unleash creative thinking and transform ideas into concrete concepts. Change management – Facilitate and implement structural changes and mergers. Experience shows great relevance of the LEGO® SERIOUS PLAY® method in other areas such as Scenario development and testing, Mergers & Acquisitions, Branding, Leadership and Team Development, Turnaround & Restructuring, Market Entry, Operational Efficiency and Competitive Analysis. If you are seeking to reveal more impactful insights, improve decision making, find hidden opportunities, stimulate entrepreneurship, improve project leadership, surface hidden issues, clarify values, roles and identities, integrate new teams and new members, resolve conflicts, integrate diverse cultures or discuss the un-discussable – then LEGO SERIOUS PLAY may be your method of choice. Someone glancing through a window at a LEGO® SERIOUS PLAY® session might think it looks like fun and games. When you’ve experienced it for yourself, you’ll know nothing could be farther from the truth – LEGO® SERIOUS PLAY® is serious business! LEGO® SERIOUS PLAY® uses LEGO bricks and elements and a unique method where people are empowered to “think through their fingers” – unleashing insight, inspiration and imagination. In a very direct way, you will be able to see what everyone knows inside the company – and what they don’t know they know! Within a surprisingly short time, an organization can have a clear, shared direction with people who are confidently aligned and committed to a course of action. It is Play with Purpose! You will explore the relationships and connections between people and their world, to observe the dynamics both internal and external, to explore various hypothetical scenarios, and to gain awareness of the possibilities. You will be building landscape models with LEGO bricks, giving them meaning through story-making, and playing-out various possible scenarios, which deepens understanding, sharpens insight, and socially “bonds” together the group who “plays” together. LEGO® SERIOUS PLAY® will guide you into free and honest exchange of opinion. The physical and tangible construction allows for you to have conversations to flow without the fear of treading on personal feelings. You will experience that the real issues are addressed and ultimately allows you to see things through the eyes of your colleagues – and have them see through yours. 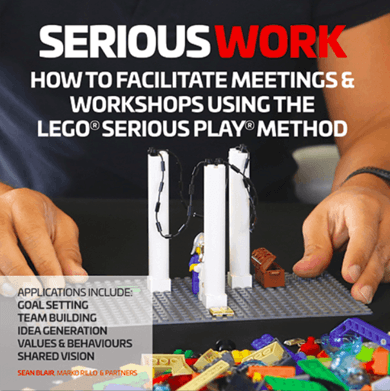 LEGO® SERIOUS PLAY® invites all participants to take an active part in the process. The common language – the bricks – treats everyone as equals and allows all opinions and aspects to be heard. In a very direct way, you will be able to see what everyone knows inside the company – and what they don’t know they know! LEGO® SERIOUS PLAY® has been in the market since 2001. During this time it has proven it’s robustness and premium value to hundreds organizations and thousands of people worldwide. Read the case stories and testimonials and find out how LEGO® SERIOUS PLAY® can have a radical effect on enhancing the performance of organizations, teams and individuals. Perhaps the most notable of these challenges was to formulate a basic strategy for the Danish project leaders that would be spending 2-3 years abroad with their families to oversee the construction of the facility. Furthermore, there was a need to bring these managers together as a team – both on a professional and personal level. After extensive dialogue and review, Novo Nordisk decided to involve LEGO SERIOUS PLAY. The directors had heard about the way LSP’s process naturally allows group members to seek and identify important problems and then allow for free expression of problem-solving ideas – and they were willing to experiment. As it often does for pharmaceutical companies, the experimentation paid off – in a big way. A two-day LSP Real Time Strategy session which even included dialogue with existing Brazilian management allowed the team to reach consensus on a concrete overall strategy for the construction of the new facility. The end benefits did not stop there. Through LSP, team members were able to identify problem areas that they had not previously seen – including some practical concerns about how their families would adjust to living abroad. What better tool to use with the families than the one that had previously proven itself to work so well? LSP was actually used again with these families – and, since the families have happily adjusted to their new homes and met many new friends through the LSP workshops, the tool was brought overseas to be used in Brazil. LSP functioned as a valuable tool in the development of the project and has contributed to the overall positive spirit. Combined with a very ambitious, holistic-oriented and professional client like Novo Nordisk, it has ultimately yielded extraordinary results. Sometimes too much good luck can be the worst thing that could happen to your business. Harco Technology, a Belfast-based financial software company was close to experiencing just that. They had developed a product that could save brokers millions of dollars annually on data purchase. With such a breakthrough came growth which strained lines of communication and internal cohesion. developers and Sales Associates – two of the most important pieces to any tech company – began to form their own varying understandings of the business and the resulting diverging organizational structure nearly resulted in a crisis. Harco understood the need for a consulting tool stronger than most others, and as part of a collaboration with the local government’s economic development organization, Invest Northern Ireland, Harco engaged in their Strategic Excellence Service. Both Harco and Invest NI reached a conclusion – LEGO® SERIOUS PLAY® was the right tool for managing the upcoming strategic issues of growth and organizational development. During a number of sessions with two pivotal LSP workshops, the collaborative efforts paid-off as Harco managed to engage the whole organization in the direction of the company and develop a potent strategy for their high tech offering. Their high expectations were only surpassed by the results yielded by LSP. Harco managed its growth successfully. Its technology is now used on over seventy trading floors worldwide while their client portfolio includes seven of the world’s top ten investment banks. ABSA is one the largest banks in South Africa. Vodacom is Vodaphone’s South African subsidiary. These two big players realized that if they were able to collaborate they could generate some significant new business opportunities. 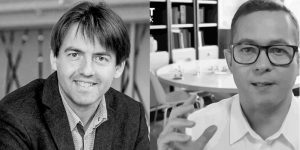 Aligning a bank and a cellular service provider looks like a great idea – but a great idea that stays an idea is not so great in the end. For two years ABSA and Vodacom had talks and meetings. Their agenda points where aligned nicely but the parties had diffi culty digging deeper into the relationship: How can we trust each other? Who is going to profi t most? What if Vodacom gets a banking license and takes off with the business on their own? “Within two weeks a task team was up and running – within six weeks we had jointly developed the new products,” explains Engelbrecht. LSP helped settle all the issues and allowed for work to begin on the new business opportunities much more efficiently than the strategic tools ABSA and Vodacom had previously been using. From this two-day LSP turning-point session on, the partnership has been proving steady and immensely successful – so much so that South Africa’s telecommunication giant Telkom has signed on to join the alliance. Blue Ridge Bank and Trust – one of Missouri’s largest independently owned banks – wished to launch a Retail Business Development strategy that would strengthen its core business. As is true in almost every strategy, the critical success factor behind this new initiative was the people. The strategy would require the Regional Branch Managers to assume new responsibilities and to work together as a team – the latter being an especially difficult task. This type of teamwork simply was not common in the financial organization’s past. In fact, the group of managers had always had difficulty with buying into business strategies that were handed down from top management. It wasn’t that they couldn’t work together – they could – but because they had never really worked as a team they functioned more like a group of individuals that occasionally worked together. A single session with LEGO® SERIOUS PLAY® changed all that. The results followed. The Branch Managers were able to come together as a team and not only discovered each other’s strengths, but also how they could work together. Action steps were taken to ensure that the Retail Business Development was launched successfully and would meet the Bank’s expectations. This business initiative has now been in place for over a year and has been integrated into Blue Ridge Bank and Trust’s 2005 businessplanning program.